IDatalink ACC-USB-RAM USB Port Cable. iDatalink ACC-USB-RAM. iDatalink's ACC-USB-RAM adapter retains your USB port when you install a new radio in 2013-up Ram trucks. You must install a CAR STEREO WITH A REAR USB AND AUX PORT. CHRYSLER 300M 2002 2004. CHRYSLER Concorde 2002 2004. CHRYSLER PT Cruiser 2002 2005. CHRYSLER Sebring Convertible 2002 2006. CHRYSLER Sebring Sedan 2002 2005. CHRYSLER Town & Country 2002 2007. CHRYSLER Voyager 2002 2003. Axxess AX-CH013-SWC. 2006 - 2010 PT Cruiser Dodge. Radio Installation Kits. 2006 - 2010 Ram Chassis Cab Jeep. 2007 - 2008 Patriot Mitsubishi. 2004 - 2007 Durango. High level speaker input. Besides cost it is likely to delay the order. Axxess CHTO-01 Interface Harness 2005-09 Chrysler/Dodge/Jeep FREE CELL ANTENNA. Axxess CHTO-01. USB updatable with Axxess USB-CAB. Amplifier Interface Harness for Select 2005-2009 Chrysler/Dodge/Jeep Vehicles. IDatalink HRN-RR-CH2. 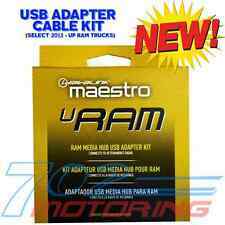 CH2 2004-2010 Chrysler, Dodge and Jeep Plug and Play T-Harness for Maestro RR. Compatible with select 2005-09 Chrysler, Dodge and Jeep vehicles. 2006-10 PT Cruiser (Base) Dodge. CRUX SOOCR-26 Radio Replacement Interface for Chrysler Dodge Jeep Vehicles Chime. Plugs into Car Harness at radio Power 4-Speaker . Crux SWRCR59D Radio Replacement SWC Retention For 2013 Dodge Ram SWRCR-59D. This harness replaces an OEM car radio harness that has been removed or cut. This Axxess XSVI-9005-NAV wiring interface lets you replace the factory radio in your 2005-11 Mercedes-Benz using the existing wiring and connectors. Connect the Axxess interface to your aftermarket radio, mount the module, and plug it into the existing factory plug. This interface provides the accessory power wire needed to connect an aftermarket stereo, along with all the connections required to install an aftermarket navigation receiver. Also, once you turn off the ignition in your Mercedes-Benz, the radio continues to play until you open the door. This interface maintains that function with your new aftermarket radio. This interface is compatible with select 2005-11 Mercedes-Benz vehicles. 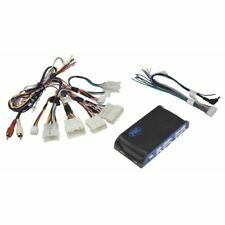 This iDatalink ADS-HRN-RR-GM5 harness from iDatalink allows you to connect a new car stereo in select 2006-up GM vehicles, working in conjunction with iDatalink's Maestro ADS-MRR module. iDatalink's ADS HRN-RR-GM5 . GM LAN11 Data Interface Harness. • ASWC harness included (ASWC not included). GM 2006-up. CHEVROLET HHR 2006 2011. PONTIAC Solstice 2006 2009. This product fits the following vehicles • Provides accessory (12 volt 10 amp). Product SKU: 154031 ID: lpcr15. Scosche LPCR15. 2006-11 PT Cruiser. 2004-2017 Select Chrysler/Jeep/Ram/Dodge Link Interface. Compatible with:Chrysler. 2006-12 Ram 1500/2500/3500Jeep. Chrysler PT Cruiser.